Kicked up turkey mini-burgers. Perfect for a crowd, even a snack or dinner. My kids adore them. 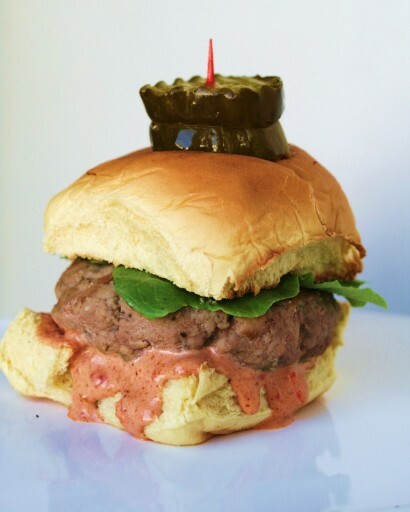 These turn plain old ground turkey into tasty little burgers. Not to mention healthy. Chop your garlic and veggies. Soak the bread in the milk for a few minutes to allow absorption. Combine turkey meat, milk soaked bread, garlic, shallot or onion, thyme, parsley, bell pepper, jalapeno pepper, cumin, hot tobasco sauce, salt and pepper. Mix until well combined. Divide mixture into 12 equal amounts then form meat into patties. Cook in a skillet over medium high heat for 5 to 6 minutes on each side. While burgers are cooking toast buns and set aside. Place sliced cheese over the patties in the last 2 minutes of cooking, use 1 or 2 slices for each patty, as you like. Spread top of buns with chipotle mayo. Place cooked cheeseburgers into buns. Set red leaf lettuce on top of burgers with red onion. I love little sliders and the fact that these are southwestern, has really got me hungry. Great flavors in the ingredient list and healthy with the use of turkey! I have saved this recipe for game day. Great post. I'm a big fan of sliders and the mayo recipe is incredible! The picture (with the pickles on top) is awesome!